The French aircraft industry was in a state of stagnation during the Nazi occupation of World War2 but managed to keep its technology base intact by manufacturing transport and trainer aircraft for the occupiers. In the early post war years French industry showed remarkable energy and innovation with a series of radical aircraft for the jet age. Some were jet powered, others had a ramjet or mixed power plant, some tail-less designs, others ramp-launched and lacking a wheeled undercarriage. As with the USA, USSR and Great Britain there seemed to be no end to the weird and wonderful creations flowing from the factories. In France, it was a period of many prototypes but few production aircraft and by 1950 only the Ouragan single seat single jet fighter had been ordered into production. 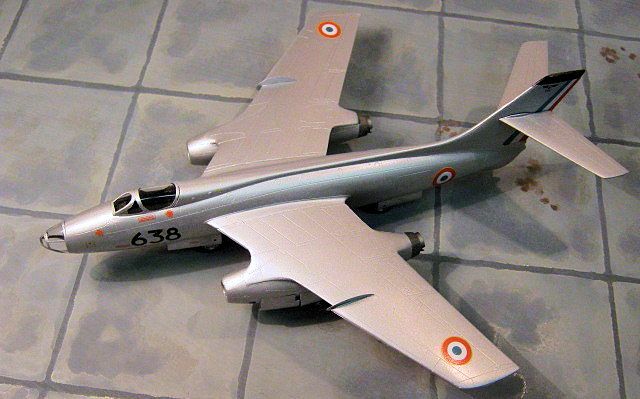 As the result of a 1951 French Air Force requirement a specification was drawn up for a multi-role twin jet aircraft that could serve both as a bomber and a heavy fighter. In October, 1952 the first of three Vautor prototypes flew. Ultimately some 140 aircraft were produced for the Armee De L’Air as it was expected to be an interim type pending the introduction of more sophisticated aircraft. It was powered by a pair of Atar 101 axial flow turbojets, an engine design developed by a team at BMW in Germany in the latter days of World War 2, the project subsequently transferred to France to permit rapid development of jet engine technology. The Vautor was so characteristic of its period as aircraft designers fought to integrate the new generation of engines into airframe designs and solve problems such as where to place the engines and how to incorporate undercarriage assemblies into the airframe. The design reflected some of the quirks of the period, with the bombardier buried in a separate nose compartment. The main undercarriage was a bicycle type housed in separate bays under the front and rear fuselage and small outrigger wheels retracted into the side of the engine nacelles. The solution chosen was vaguely reminiscent of Boeing’s B-47 six-jet bomber and closely mirrored the Yak25/28 series from the USSR. The Vautor was produced in three distinctive and contrasting versions. The II.N was an all-weather heavy interceptor with a two-seat canopy and a solid nose housing four 30mm cannon, later refitted to carry four semi-active underwing missiles. 70 were built. The Vautour II.A was a single seat tactical bomber with the nose cannon of the II.N and an internal weapons bay for three 1,000lb bombs. They did not see squadron service in France and 25 of the 30 built were transferred to the Israeli Air Force. The Vautor II.B, of which 40 were built was intended as a tactical strike aircraft with a nuclear option. No cannon were fitted and the glazed nose housed a navigator/bombardier. The weapons bay could carry three 1,000lb bombs with an additional two or four 1,000 or 500lb bombs underwing. The Vautor was capable of about Mach 0.9 (680mph) at sea level and had a tactical radius of 750 miles. The first operational bomber unit , Escadre De Bombardement 1/93 Bourgogne stood up at Cognac on 1 March 1958 and in replacing the Douglas B-26 in French service illustrated just how important the Vautor was in terms of advanced capability. In the course of 1959 the type was involved in well-publicised long range flights to Ethiopia, Chad, Iran, Congo, Madagascar and Thailand to emphasise the long reach of France’s new state of the art weapons systems. The type was progressively replaced from 1964 by the much more capable Mirage IVA but the gradually dwindling fleet lingered on into the early 1970s. Some 12 II.B airframes were modified for a high/low level reconnaissance role and some were diverted to monitoring French nuclear tests in Polynesia. 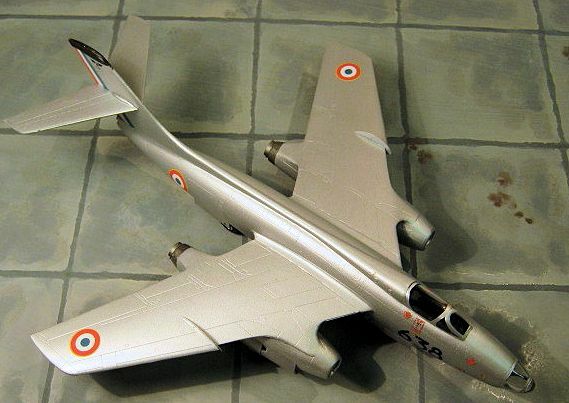 The Vautour proved to be a rugged and versatile type that brought the Armee de l’Air into the jet and nuclear age. The project comes in a stout tray-type box that proclaims the kit to be “Designed and concept invented in France. Tooling and moulding made in the Czech republic”. The instructions even refer to the Czech-based CMK kits website. So the package is a familiar one that applies to products from CMK/Special Hobby/MPM and that is reassuring. I am a big fan of Special Hobby/MPM kits and must have made ten or more of them in the last couple of years. I like the fact that you get everything that you need in one box, with no pressure to buy aftermarket items. There are four frames of parts moulded in a medium grey soft plastic and one of clear. The plastic has neat and subtle etched detail and was essentially free from flas h, with the sprue gates small and unobtrusive. There were the inevitable ejector towers that are to be expected with shorter run kits, but these can be easily trimmed away at the construction stage. Five small bars of resin details are provided to cover the engine intakes and exhausts, small undercarriage parts and a host of tiny levers and door hinges some of which proved too challenging for my 1949 model year eyesight. There is a sheet of stainless steel etch for the seatbelts, instrument panel and rudder pedals and a tiny piece of film for the instruments. The clear parts are commendably thin and form a one-piece hood for the pilot and a clear nose cone for the bombardier. The instructions are a 12 page booklet of A5 size in grey scale with a parts chart, 16 stages of pictograms for assembly and a choice of four colour schemes with a helpful link to the CMK web site where colour profiles of the subject are said to be available. Colour call outs are restricted to the Gunze Sangyo paint range, with no equivalents or FS numbers specified. The smallish decal sheet is nevertheless comprehensive offering a choice of four Armee de l’Air aircraft in overall natural metal. The decals are neatly printed in good register and include a range of tiny stencils. This is a well engineered kit that is well at the upper end of the spectrum for short run moulds but it still rewards careful assembly in dry fitting all parts before committing to glue. In most cases the joining faces between parts will benefit from a light pass over with a fine grade sanding stick. Construction commences with the interior and the separate compartments that form the cockpit, nose area and the two main wheel bays are built up from flat plates and bulkheads. There are plastic side consoles for the pilot and bombardier and, for my taste, more than adequate knobs and levers in tiny resin castings with the seat belts and main instrument panel in etched stainless steel. The two ejector seats are built up with separate arm rests and head rests. The complexity of the interior would do justice to a 1:48 scale kit. Colour call outs suggest that much of the crew area is black painted and the reality is that much of the interior will be concealed. The gear bays were finished in matt aluminium. The instructions suggest that the gear legs are assembled before the fuselage halves are joined and I followed this sequence since the upper parts of the legs are seated into plastic half hooks cemented to the face of the interior bulkheads and this sequence gives maximum opportunity to ensure that the hooks are correctly aligned and fully secure. The gear legs are a remarkable piece of engineering for a 1:72 kit, the nose leg in particular consisting of no less than 13 parts including the wheels and the rear leg 10 parts. Such a pity that they are buried inside the completed fuselage. 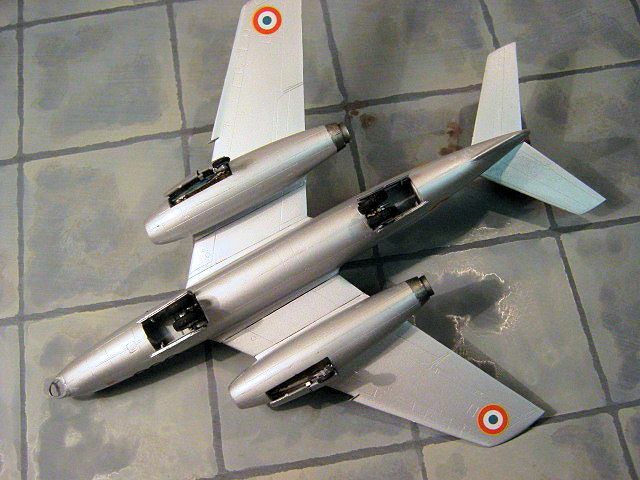 With the various internal compartments secured, the fuselage halves went together without fuss. I had reasoned, correctly as it turned out later, that no nose weight would be required. Attention next turns to the wings, formed as separate port and starboard units and quite the most impressive mouldings that I have seen in a so called short run kit. They are formed in one piece from root to tip including the subtle leading edge droop of the outboard section. The only lower sections required are a small plate that fills in the inner section between the engine nacelles and the fuselage. The engine nacelles are split vertically and each outboard half has a cut out which is backed by a curved panel with a representation of the side face of the Atar engine. The intake and exhaust sections are provided in sharply moulded polyurethane resin beautifully crafted to fit inside the nacelle halves with minimal adjustment. Although not mentioned in the instructions each resin insert has a faint vertical datum line cast in to aid alignment. The resin inserts are moulded blanked off to the rear so there is no see through effect. Although the resin was a joy to fit, I had a little trouble aligning the inserts inside the plastic intakes, probably more a case of operator error than design flaw. I built the wings as separate sub assemblies complete with engine nacelles, then fixed the wings to the fuselage halves secured with good sized locating tongues that were a positive fit. So far only minor traces of filler were necessary along some of the main joints. I left the tailplane halves until the end of the build, guessing that the rudder stripe decals might get in the way. After leaving the airframe to harden up overnight I added the metal wing fences secured with superglue and fixed the transparencies masked with Tamiya tape. The whole airframe was then primed with Tamiya Fine white primer from a rattle can while the tailplane and gear door parts were primed separately. All four choices were of natural metal airframes, I chose the one of the four that did not have an black anti-glare panel on the nose but did feature a blue/white/red striped rudder. The whole aircraft was sprayed in Tamiya XF-16 Flat Aluminium and the fin tip picked out in X-18 Semi Gloss Black. Again left to settle overnight the whole airframe was then rubbed down with an ultra fine sanding stick and then brush finished with two coats of Future/Klear. The main gear legs and doors were added. I found that the rear legs sat too far into the fuselage and had to be packed out further with small wedges of plastic card so that the wheels sat clear of the fuselage. This was a bit annoying after I had spent so much time in the early stages of the build in aligning the fixing hooks, but probably operator error again. When the main gear had dried I jigged the aircraft on a flat surface and added the outrigger legs and wheels to the pockets in the side of the nacelles. Doing this with a jig (actually sliding paint jars under the wing tips) allows the outriggers to be fiddled and adjusted to be in contact with the ground while the glue sets. Finally the nacelle gear doors and tailplanes were added. Voila! Like most kits from the MPM/Special Hobby stable I found this an absolute pleasure to build, so congratulations to Azur for their concept and design. As with all models of this kind, slow and steady are the watchwords with plenty of overnight breaks to allow things to settle. I liked it, I enjoyed the build. Recommended to those with a taste for less obvious subjects.